This 1/2 watt metal film resistor is specifically designed for audio applications. The special construction features flat frequency response, low noise (thermal EMF), and non-magnetic leads/end caps. 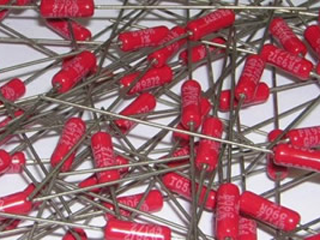 Every resistor is tested for noise during the QC process. The leads are Tin plated OFHC 22 AWG. Tolerance is better than 1%. TC is better than 50ppm/deg C (unlike the cheaper 100+ppm sold by everyone else). Rated up to 500VDC. Dimensions 0.14"D x 0.39"L.